It starts Saturday today, April 28, ‘till October 28, at the Archaeological Museum of Ancient Capua, the exhibition “Annibale in Capua”, dedicated to the great Carthaginian leader, to his grandiose enterprise in Italy and, in particular, his stay in Capua, in the 3rd century BC. 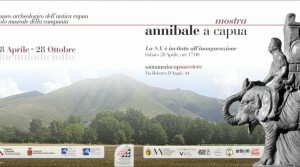 The exhibition is the third stage of the project “Hannibal. A Journey “, promoted by the Municipality of Barletta and developed in collaboration with Capitale Cultura Group, from an idea and with the curatorship of Filli Rossi, with the support also of Drypto for multimedia contents and installations. After the exhibition at Castello Svevo di Barletta, in 2016 and at the National Archaeological Museum of Capo Colonna (Crotone), here is finally the long-awaited appointment in Campania. The exhibition was promoted by the Campania Museums Pole, with the Municipality of Santa Maria Capua Vetere and the Superintendence of Archeology, Fine Arts and Landscape for the provinces of Caserta and Benevento. Precious was collaboration with the National Museum of Archeology of Naples and the Provincial Museum of Campania. In the exhibition, the presence of Hannibal in Italy is particularly linked to the events that involved Capua, who had the ambition of being able to replace Rome, allying with the “one-eyed man” the terrible enemy of the Roman people. The exhibition itinerary – with over one hundred works, evocative videos, iconographic apparatuses and an interactive game to enter the history of the leader – offers the opportunity to know in depth one of the most fascinating characters in history: fearsome adversary of Rome, military genius, but also a man imbued with the Hellenistic culture that permeated the ancient world. Symbol of the exhibition is the war elephant, dated to the II-I cent. to. C., that the MANN Museum, partner of the exhibition, has lent together with other important objects, including a splendid bronze breastplate, similar to the valuable specimen found in the Tunisian desert at Ksour Essaf and the bust of Scipio, historic opponent and finally winner of the Carthaginian.